Enjoy this relaxing year-round retreat set on a large, wooded lot on beautiful Magician Lake. Large windows overlooking the lake provides gorgeous views from every room. Stone floor to ceiling fireplace accentuates two story great room with wet bar area and grand piano. Large breezy deck is shaded by towering oaks adjacent to the great room. It provides a generous space for large family gatherings with a high boy table and chairs for 8 and a large Genesis 5 Weber gas grille. Also a 4 top regular height table. 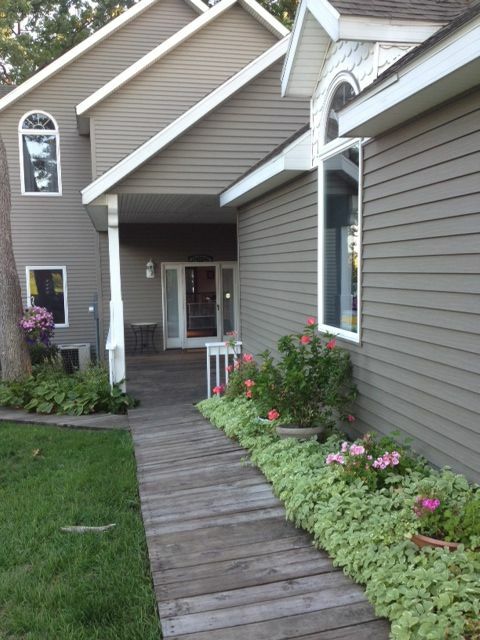 Steps from the deck lead down to a large lakefront lawn perfect for games and sunning. The spacious modern kitchen overlooks the great room and lake. It has two large tables for family dinners. Covered rear deck off kitchen provides additional outdoor eating space, a quiet outdoor retreat, as well as an ideal play area. Stunning master suite has a king-size bed, heart shaped Jacuzzi tub, shower, fireplace and walk in closet. Giant sliding doors expound onto a deck that provides serenity, and an incredible view of our 3 islands and lake. There are four additional large, tastefully decorated bedrooms providing two queen-size beds, one set of double bunk beds, 1 set of twin bunks,a trundle bed and and a separate twin bed. Also a crib. Swim, fish, and boat on sandy bottom 600 acre lake. Gradual depth makes swimming off dock ideal for children. Two marinas with boat rentals. Or rent my brand new Avalon Pontoon! Would you like a quick weekend getaway from the metropolitan area? Then you can rent for a shorter week at a reduced rate of $2500 from sunday-thursday[Except mid-June thru Mid August] Just hop on 80-94 east and enjoy the new four lane expressway. It gives time to get ready, pack up, and enjoy the best part of the week on our lake. During the week it is peaceful and calm time. It's a great time to ejoy our canoe and paddle boat. You can also rent our brand new pontoon at any time that seats 12 passengers. Only owner. My husband and I had our home custom built,for family gatherings. Providing Comfort and space. Great times on Magician Lake! My children are 4th generation on Magician Lake. We wanted our children to enjoy the same wonderful experience we grew up with. Designed for large families who want to spend Quality time together in a clean,spacious,beautiful environment! Sandy bottom gradual depth shallow at shoreline. Ideal for toddlers. 4.5 feet deep at end of pier with 12x12 platform at end of pier ideal forswimming,fishing,sunbathing. Spectacular views from all rooms of lake and island. Large grassy lawn ideal for games,sunning,and a burn pit for campfires. HUge kitchen lots of counter space,granite tops,island with sink overlooking lake! The lake house was designed with huge living areas designed for large family reunions and 3 levels to offer privacy too. very quickly as the depth along shoreline is shallow. as volleyball nets,showers,toilets,and food vendors. There is a children's museum,and many nice restaurants. We have Indian Lakes Golf Course,which has 2 18 hole courses and a great restaurant 'Timberline Inn',fine casual dining at very reasonable prices.